You know you're a rock star when Time magazine includes you in its annual list of the 100 most influential people in the world. Two years ago, Ford CEO Alan Mulally made it. This year it's Fiat-Chrysler CEO Sergio Marchionne's turn, rubbing shoulders with the likes of Julian Assange and Colin Firth. And there are some genuine rock stars, too, like Sting and Patti Smith. Many of the miniprofiles in the special issue were written by people with some celeb status of their own. Marchionne's was penned by Steven Rattner, former chief of the Obama auto task force. 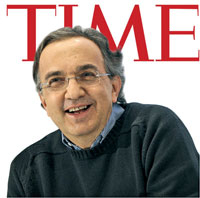 "Without Sergio Marchionne, America's No. 3 automaker would almost surely not exist today," observed Rattner. "His vision for what a Chrysler-Fiat alliance could achieve, his success at turning around the faltering Italian company and his limitless energy were all critical to President Obama's decision two years ago to keep Chrysler afloat using taxpayer dollars."